Light Deflection by Gravitational Waves: Changes in the distribution of mass or energy, in a small region, create changes in gravitational fields. These changes propagate away from that region at the speed of light, as gravitational waves. Like the nearly-static gravitational fields of the Sun or in gravitational lenses, gravitational waves deflect light rays. Over periods short compared with the period of the gravitational wave, these deflections produce apparent proper motions of distant astrophysical objects, as shown at left. The Low-Frequency Gravitational-Wave Background: A collaboration of Ted Pyne (Harvard Univ. ), T. Marshall Eubanks (US Naval Obs), Mark Birkinshaw (Bristol Univ), Demetrios Matsakis (US Naval Obs), and Carl Gwinn (UCSB) searched for this pattern. They used measurements of the apparent proper motions of quasars to determine an upper limit on the total mass-energy density of gravitational radiation, with periods greater than about 20 years. They found that the energy density in such waves is less than 0.02 of that required to close the universe. Deflection by Gravitational Waves from Localized Sources: As shown schematically below, a light ray that passes close to a rapidly-changing source of strong gravitational fields, such as a binary star system with a tight orbit, can suffer large bending near the source, where gravitational waves are strong. Could we detect gravitational waves by looking for bending of light rays that pass close to a binary system? A collaboration of Sergei Kopeikin (TPI, Jena), Gerhard Schaefer (TPI, Jena), Marshall Eubanks (US Naval Obs) and Carl Gwinn (UCSB) has determined the pattern of astrometric deflections and changes in pulse arrival times expected from a foreground source with a time-varying mass quadrupole moment, such as a binary star system. These effects turn out to be orders of magnitude smaller than one might expect, because of surprising symmetries in General Relativity. Testing General Relativity: Because light deflection by gravitational radiation cancells so completely in General Relativity, a search for the effect might constitute a null test of General Relativity in the radiative limit, where few tests of this theory have been made. Kopeikin and collaborations are examining the question of what sorts of theories predict nonzero deflection. 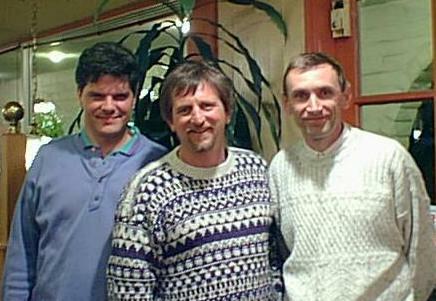 Left to right: Carl R. Gwinn, Hal S. Kopeikin, Sergei M. Kopeikin.